I don't drink beer or spirits but I do like a glass of wine. I like two glasses even better, but although I'm not a big drinker I always enjoy choosing a bottle of wine for the weekend. 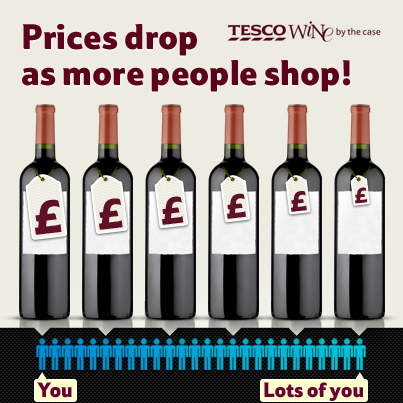 I always have an upper limit in mind for how much I want to spend on a bottle, so I was very interested to read about this idea from Tesco. 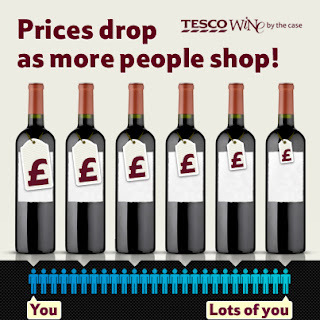 They've set up Tesco Wine Co-buys which is a new way of buying wine. The more people who buy together, the cheaper the price gets and - get this - whoever brings in the most people gets their wine for free. THAT'S FREE WINE! Just remember that you have to sign-up for alerts, spread the word to friends to encourage more people to buy, and if you can't see any wines you like on the list you can always request a co-buy of your own choice.